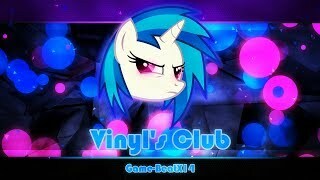 I've been notice that a few people have been commenting whenever Vinyl Scratch is involved. Whether it's one of my blogs, her appearances in the Shineverse, or to a lesser degree, Deafened by Silence. Rose: You know, the other story he wrote that has barely any views and only four comments. Judging by the newest episode, it would seem my theory was correct. 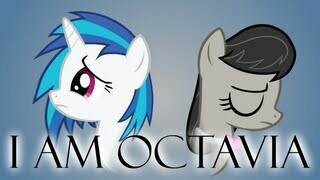 Vinyl doesn't speak even once in the episode, and both the Doctor and Octavia don't react at all to her silence. What does that mean for us writers in the future? Those of you who read Shine would remember me talking about how in the novelization of the Rainbow Rocks shorts, Vinyl Scratch, despite having a major role, doesn't speak a word. Instead, she communicates through text messages instead of dialogue. You'd also remember how when I wrote Vinyl, I did the same thing, holding her to the fanon of being completely mute. Only nine days between story uploads? I think that's a new record for me. This one is a story about Vinyl Scratch having a creative block while making music, and asking Octavia for advice. Just a short, sweet slice of life fic. Vinyl Scratch is hard at work on a new song, but hits a creative roadblock during production. Seeking advice, she decides to contact her musically inclined friend Octavia for help. Check it out and let me know what you think! I had fun writing it and designing the cover art. I don't usually opt for EQG material, however I've recently been listening to 'Relax' by 'Frankie Goes to Hollywood' and, after a quick comparison, have come to the conclusion that the short 'Music to My Ears' can potentially work pretty well if synchronised with this song. If you follow me on any other site then you've probably already seen this, but I'll post it here anyway for visibility. My newest pony track is now on YouTube! Go check it out if you're interested. 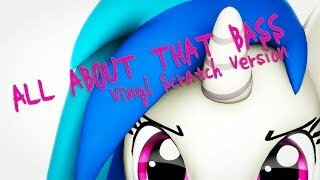 I've written fics with Vinyl Scratch in them so this is my attempt at the actual music side of her. I wrote a new one shot for the Deadlyverse that has Vinyl and Octavia meeting Octavia's parents later in the timeline. I look forward to continuing to expand the universe both on the main story and with other side stories. Check it out here! I finally managed to get a story far enough along to make an announcement about it. Yay? Well it only took me like... (Looks at the signup date) Aww, shhh- Well, whatever. It's going to be a four story (probably?) story about Vinyl receiving a special present for her birthday. The title isn't final, so I won't spoiler it, yet. So I was watching Legend of Everfree and was watching the tent assignments scene. I noticed that the most popular EqG ships were paired up. But then there was Fluttershy and Vinyl Scratch rooming together. I figured that could be a ship for a tame spin-off of the Sunset's Day series. Tell me what you think about a FlutterScratch ship. You think it might work? I was finally able to figure out who to put in a background I have completed a month (or two) ago. She even comes with her little poem. Tonight was the time for relaxing. For a show that would fill her essence. 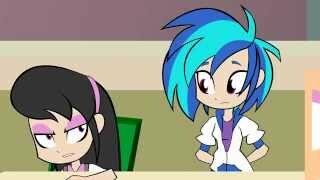 Now that Vinyl Scratch being mute is canon, I think Fimfiction should have its own group celebrating that. Basically, that means fics and discussion about or involving Miss Scratch where she doesn't speak. Rose: It doesn't matter that there's already a Vinyl group. The fact that someone made a group specifically involving her and Octavia as vampires more than qualifies this idea. You know, when Music To My Ears happened, I expected EQG Vinyl's fandom to blow up. Which it kind of did. And when it did, I also expected tons of fics to follow from that, especially given her role in Rainbow Rocks. Hi people, it's me, Wave. Because I will never write it in full and proper [and because I honestly don't have anything beyond the starting premise] here's another story idea I have. Ok, set up is this. This is/was a major fandom work back in the day as one of the earlier show-like animations so if you haven't seen it, watch it and if you have you probably haven't watched it in a while so watch it. Waiting for my dentist appointment. Got here 40 minutes early. Oops! Ah well, at least I'm not 40 minutes late, right? Just listening to electro swing and reading University Days. I know I've been absent lately, but I've just been having fun story planning a new fic. Seriously, I have no idea. I know, of course, that Soarin' and Applejack create my favorite pairing of SoarinJack and the first my little pony fanfic that I ever read was part of a AppleDash series. I know the name of many more obscure shippings as well, such as TwiFire, RariDoo and LunaMac, but I don't know the name of one of the most unchallenged* ships our fandom has to offer! It's like not knowing that Rainbow Dash is the victim in Cupcakes!